On January 1st, 2018, the UCF Knights defeated the Auburn Tigers 34-27 in the Chick-fil-A Peach Bowl in front of a sold-out Mercedes Benz Stadium and finished the college football season as the only undefeated team in the country. The question that has been tossed around the media is, does that mean UCF can be considered national champions? After the game, UCF quarterback McKenzie Milton made this statement: “You can’t argue 13-0, you can go ahead and cancel the playoff now,” suggesting that the Knights had already captured the national championship trophy. On January 3rd, the Knights’ football program went all in. That morning, UCF Athletic Director Danny White jumped on the 96.9FM radio show ‘The Game’ and said that a national championship parade would indeed take place. That same afternoon, the school announced a championship parade would be held at Disney World on Sunday. In addition, a national championship banner will be hung in UCF’s Spectrum Stadium. So are the Knights National Champions? Short answer: Even though, the undefeated and underdog UCF Knights beat the 10-point favorite Auburn Tigers, they are “technically” not national champions. The Knights were not invited to the College Football Playoff, and therefore did not play for the “official” national title. The College Football Playoff national championship game is this coming Monday, January 8th, between the Alabama Crimson Tide and the Georgia Bulldogs, notably two teams that lost to Auburn in the regular season. However, let’s dive deeper into this topic. Sound familiar? Well it should, however this time, it wasn’t UCF’s Milton who said this. It was none other than Auburn Tigers’ starting quarterback Jason Campbell. In the 2004 season the Tigers had finished undefeated and crowned themselves champions and at one point you were even able to buy Auburn national championship rings on Ebay. However, they also did not play in the national championship game. Instead, Auburn played in the Sugar Bowl and beat Virginia Tech, the ACC champion and ranked #8 by the Bowl Championship Series (BCS). Meanwhile, Southern California and Oklahoma played for the BCS National Championship in the Orange Bowl. (USC’s victory was later vacated due to NCAA ruling.) 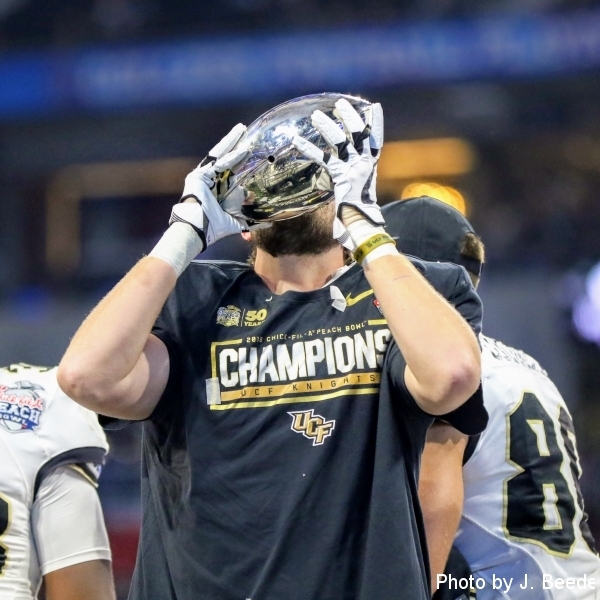 The Tigers, like the 2017 Knights, believed they had every right to claim a national championship. They were a really good football team with Campbell at quarterback and the running back duo of Cadillac Williams and Ronnie Brown in the backfield. There have been numerous claimed titles in the past, not to mention Alabama’s 1941 three-loss season (one in which the Crimson Tide finished 20th in the AP Poll) where they claimed the national championship. The Tide claim they have 16 national titles, but the NCAA only acknowledges 14. If major football programs like Auburn and Alabama can claim national titles, then why can’t UCF make the same claim? One of the biggest argument against UCF’s self-proclaimed national championship is their strength of schedule (SOS) or lack thereof. There are multiple ways and numerous equations to calculate SOS. For example, the Warren Nolan Strength of Schedule equation has UCF with the 12th toughest schedule, one spot behind Alabama’s. According to USA Today’s Jeff Sagarin Ratings, UCF’s schedule, after the Peach Bowl, is ranked 7th above the Wisconsin, Auburn and the University of Miami schedules. However, those two calculations refer to the difficulty or ease of a team’s opponent as compared to other teams. And, SB Nation’s Résumé S&P+ takes it one step further. They look at a team’s season scoring margin and compare it to what the average top-five team’s scoring margin would likely be against the schedule at hand. Based on the findings of SB Nation, after 14 weeks UCF had the 10th toughest schedule in the country and their average scoring margin was approximately 3.8 points ahead of how the average top-five team would be expected to perform. It could be argued that UCF’s schedule wasn’t the toughest in the nation, however it certainly was not a cake walk. According to ESPN’s FPI, the SEC conference team Alabama would have had a 50% chance to go undefeated against UCF’s schedule. Georgia would have had only a 36% chance. Including the 2018 Peach Bowl, UCF had the 6th toughest SOS, based on ESPN’s FPI. Just how committed is UCF (and the community) to considering themselves national champs? They’re all in. According to multiple reports and confirmed by Danny White, the Knights are paying the 2017 coaching staff the national championship bonus that was part of their contract. In addition, the players and coaches will be receiving rings honoring the national title. And as previously mentioned, a parade will be held at Walt Disney World Magic Kingdom Park and the Knights will march down Main Street, U.S.A. Sunday afternoon to celebrate the perfect season and the Peach Bowl victory. Additionally, a free block party will be hosted Monday evening by the city of Orlando on Church Street celebrating the national championship and as of Thursday, national championship merchandise is on sale. Even Wikipedia is in on the fun, citing a “claimed national championship” on the UCF Knights Football page. UCF fans around the country are using the hashtag “#MyNationalChampions” on social media and a newspaper in Virginia declared the Knights national champs. The national recognition that UCF has received from this campaign has been a success in itself. Besides, the Peach Bowl is over and UCF is still being talked about on a national stage. Let’s allow the Knights to have the fun they deserve and not to rain their parade. Regardless of how you feel about UCF’s claimed national championship, one thing is for sure, the College Football Playoff system appears to be in need of repair. “It looked like a conscious effort to me to make sure that they didn’t have a problem if they put us too high [in the rankings] and a couple teams ahead of us lost,” said Scott Frost after the Peach Bowl referring to the College Football Playoff Committee’s decision to rank the undefeated UCF team behind multiple programs with one or more losses throughout the regular season. Many believe Frost is right. UCF beat a team who the beat the teams playing in the national championship game. No, this does not make UCF automatic champions, but it does however, prove that the College Football Playoff needs to be fixed. The College Football Playoff needs to expand to 8 teams, which would include the highest ranked Group of Five school in the country in the playoff . UCF needs to be added to a Power 5 Conference. The American Athletic Conference has been around for five years and the Knights have won three conference championships. They have won two New Year’s Six Bowl games over then No. 6 Baylor and No. 7 Auburn in the last four years. If you take anything away from this historic season, it’s this: the University of Central Florida Knights are ready for the next level. Besides, they’ve already won a national championship!